Amrita Institute of Medical Science has been providing compassionate care through Telemedicine since 2003, servicing remote islands such as Lakshadweep and Andaman-Nicobar, as well as Leh-Ladakh in Kashmir. 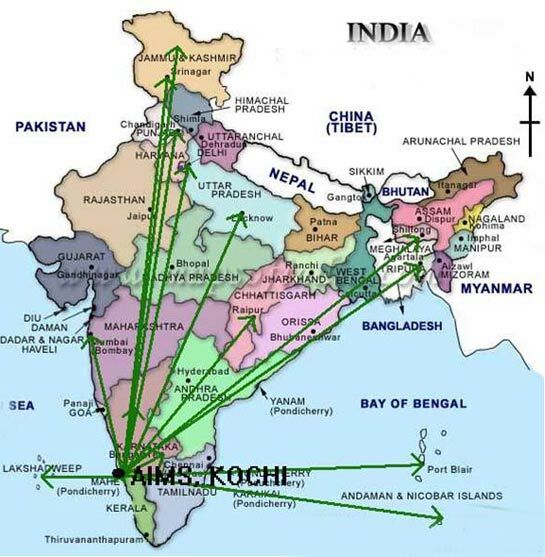 Now, 60 National centers in India and 9 International centers are connected from Amrita Hospital, Kochi. Aside from providing consultations to the remote corners of India, Amrita uses its telemedicine link to educate doctors in remote primary centres in the latest medical advancements through seminars, workshops and teaching programs. Aside from providing consultations to the remote corners of India, Amrita uses its Telemedicine link to educate doctors in remote primary centres to the latest medical advancement through seminars, workshops and teaching programmes. Amrita’s Telemedicine programme is made possible through its link with an ISRO [Indian Space Research Organisation] satellite. * Cancer diagnosis and treatment prescribed for SNM Hospital patient in Leh, Ladakh. * Videoconferencing also opened up new possibilities for continuing medical education or training for isolated or rural health practitioners, who may not be able to leave a rural practice to take part in professional meetings or educational opportunities. * DNB teaching programmes is being telecasted to other telemedicine centres, like Tiruvananthapuram Medical College. * On 13th January 2003, Amrita’s first remote tele-surgery procedure was performed. The Amrita Emergency Care Unit at Pampa (on the way to Sabarimala shrine of Lord Ayyappa, a famous pilgrimage centre in eastern Kerala) was able to save the life of a pilgrim by the tele-surgical procedure using the local telemedicine facility. The cardio-vascular thoracic surgeon guided the procedure remotely and the pediatric cardiologist at Pampa performed the procedure. * Both national and international seminars and workshops are being conducted regularly at Amrita.